Country Music Hall of Fame Medallion Ceremony - Watermark Communications, Inc. Watermark Communications, Inc.
One is a compelling vocalist and consummate showman with an outgoing, sometimes outrageous personality that glowed on stage and on camera; the other is a reserved, reclusive wizard who quietly created magic with his songwriting and his stylistic grandeur as a record producer. As different as they are, Ferlin Husky and Billy Sherrill both helped modernize country music in the post-rock era, ultimately prodding the genre to grow in popularity and artistic sweep. For those lasting efforts, Husky and Sherrill were welcomed into the Country Music Hall of Fame in a near two-hour Medallion Ceremony on May 23. For the first time, the ceremony took place in the Country Music Hall of Fame® and Museum’s Curb Conservatory. The event’s customary home, the Museum’s Ford Theater, is undergoing repair of damages received during Nashville’s recent catastrophic flood. Considered country music’s most prestigious night, the Medallion Ceremony represents the official induction of new Hall of Fame members. Country music stars Jimmy Dean and Don Williams, who were elected into the Hall of Fame along with Husky and Sherrill, will be officially inducted at a separate Medallion Ceremony on October 24. During the ceremony, the 84-year-old Husky and 73-year-old Sherrill listened to highlights of their lives and careers as well as to surprise guests who performed their classic songs. Those paying tribute to Husky included songwriter Dallas Frazier, who performed “Freckles and Polliwog Days,” a song Frazier co-wrote with A.L. “Doodle” Owens that Husky released as a single in 1974; Ronnie McDowell with the Jordanaires and 87-year-old soprano Millie Kirkham, who performed “Gone,” Husky’s classic #1 hit from 1957, which included the Jordanaires and Kirkham on the original recording; Ricky Skaggs and the Whites, who performed Husky’s crossover hit “Wings of a Dove,” a #1 from 1960; and Webb Wilder, who performed “I Feel Better All Over (More Than Anywhere’s Else),” a #6 hit from 1955 that represented Husky’s comic side. Those paying tribute to Sherrill included Shelby Lynne, who performed “Stand by Your Man,” a #1 hit from 1968 recorded by Tammy Wynette and co-written (with Wynette) and produced by Sherrill; Ronnie Milsap, who performed “The Most Beautiful Girl,” a #1 hit from 1973 recorded by Charlie Rich and co-written (with Norro Wilson) and produced by Sherrill; Craig Morgan, who performed “Almost Persuaded,” a #1 hit in 1966 for David Houston, co-written (with Glenn Sutton) and produced by Sherrill; and Lee Ann Womack, who performed “He Stopped Loving Her Today,” a #1 hit in 1980 produced by Sherrill. 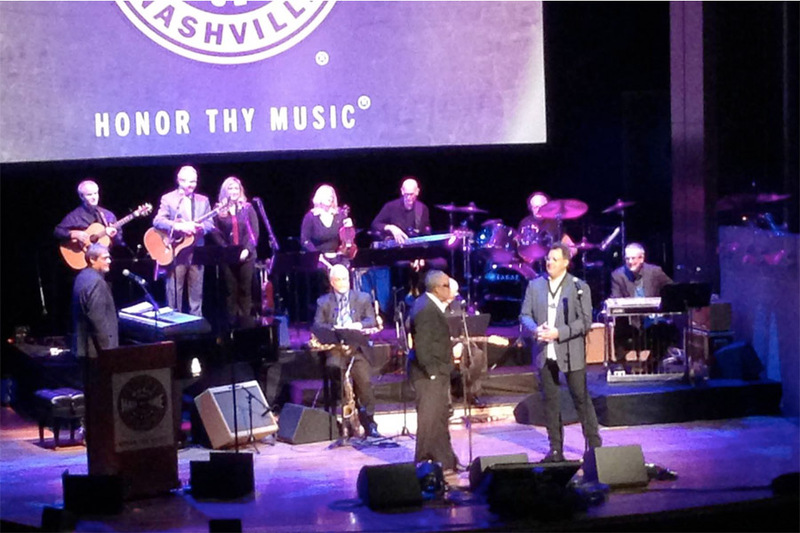 Live performances began with Vince Gill joining the Settles Connection choir in performing “Oh Happy Day,” backed by the Medallion All-Star Band, led by keyboardist and music director John Hobbs. Joining Hobbs were drummer Eddie Bayers, pedal steel player Paul Franklin, electric guitarist Steve Gibson, bassist Michael Rhodes, fiddler Deanie Richardson, background vocalists Dawn Sears and Jeff White, and acoustic guitarist Biff Watson. As in past years, Watermark provided the broadcast audio mix for simulcast throughout the complex and media outlets covering the event.